Workers sort and pack strawberries at the Chambers Flat Strawberry Farm south of Brisbane. THEY handle some of the state's most complex and challenging investigations, into organised crime networks, drug lords and acts of terror. 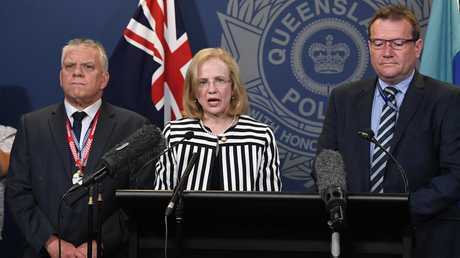 When French national Smail Ayad went on a terrifying stabbing rampage at a north Queensland backpacker hostel, shouting Allahu Akbar as he killed two people, detectives from the Drug and Serious Crime Group were tasked to investigate potential terror links. When police announced in recent days that meth, cocaine, ecstasy, LSD and cannabis had been seized - just days before Gold Coast schoolies celebrations - it was those same detectives who'd spent five months following the trail. But in September, a different kind of case crossed the desk of these seasoned investigators. Two mates who'd dropped into a northern suburbs Woolworths for a punnet of strawberries had found part of a needle embedded in a piece of fruit. For them, it was a Facebook-worthy anecdote. One had ended up in emergency, terrified he'd swallowed half the sharp metal object. 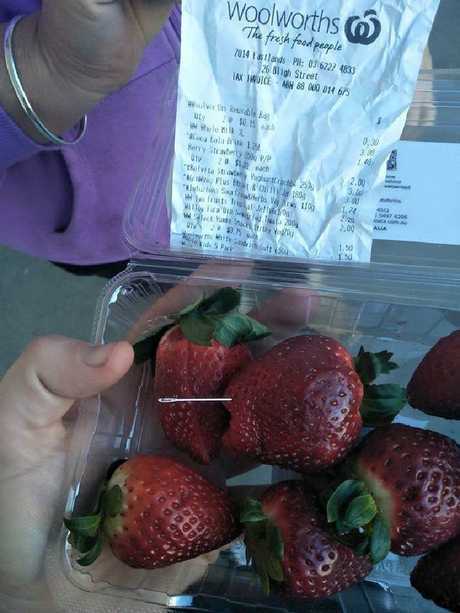 Soon after, two more needles were found in punnets of strawberries sold in a Geelong supermarket. Then a mum in Gladstone discovered needles in strawberries she'd given to her young children. It became a health crisis. The Facebook post that led to a mass product recall that brought the entire strawberry industry to its knees. Workers laid off. Trucks filled with rotting fruit, dumped in the bush. 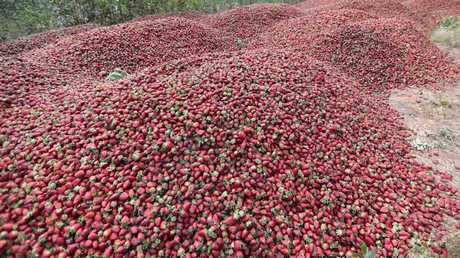 A mountain of red on a landscape of brown. 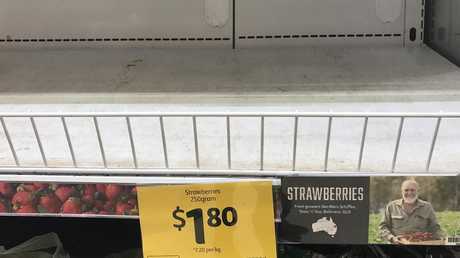 Supermarket shelves empty, customers warned that one of Queensland's most popular summer treats was temporarily off the menu. Dozens of copycat incidents that would, as the days passed, turn to hundreds. When Queensland's chief health officer fronted the media on September 12, both she, police and the Government assumed that alleged first act of sabotage would be the last. Anyone who had bought the brands Berry Obsession and Berrylicious - sold mostly at Woolworths stores - should throw them out. But any punnets purchased going forward were safe, consumers were assured. "I love strawberries, there is no reason to stop eating strawberries, we just need to be aware of this incident," Dr Jeannette Young told media. Queensland chief health officer Jeanette Young announces the contamination crisis at a media conference. Industry body Growcom urged Queenslanders to take Young's advice. Strawberries were safe to eat, they advised. The incident was over. "If consumers still have concerns, we recommend they chop fruit in half first before consumption," Growcom's Rachel Mackenzie said. A team of detectives was already hard at work. But the investigation was challenging. Many of the workers at the Wamuran strawberry farm that supplied berries for the two brands did not speak English as their first language. And fruit pickers are transient. They come and go. Already, rumours had spread of a worker with a grudge. An ex-employee. Police were not convinced. Detective Acting Inspector Terry Lawrence said they were keeping an open mind. At least 100 workers and former workers from the farm were being interviewed by police. "I don't know anything. 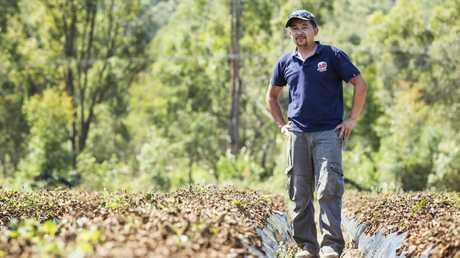 I'm like you guys, I want to find out," Kevin Tran, who runs the Berrylicious/Berry Obsession farm told media. On September 13 - only a day after Dr Young and Growcom's reassurance that strawberries were now safe - the copycats began. Staff at Coles in Gatton had called police after finding a needle in a strawberry punnet. This one appeared to have been placed on top of the berries, not inside them. It did not, authorities said, appear to be linked to the original incidents. Dr Young revised her advice. "Be ultra cautious and simply cut up those strawberries before eating them," she said. But the following day, things got worse. Needles were found in three more punnets - in Redbank Plains, Tweed Heads and Everton Park. And now another brand had to be recalled. Queensland Health put the word out to supermarkets. Donnybrook strawberries needed to be pulled from the shelves too. "If you have Donnybrook strawberries at home, or are unsure of the brand, you should return them to the store or throw them away," Dr Young said. Tiny sewing needles were now putting Queensland's $160 million strawberry industry at serious risk and Premier Annastacia Palaszczuk was furious. "It is simply unacceptable," she said. People were being put at risk. Children were being put at risk. "I am making a plea to any member of the public - if you have any piece of information, please do not hesitate to come forward. "I know the police are absolutely focused on finding who is responsible." And they were. Like with any investigation, detectives were rounding up witnesses, taking statements, determining people's movements. Needles - especially the ones taken from those initial incidents - were sent off to be DNA tested. A $100,000 reward was put on the table. Calls started coming in to Crime Stoppers. And another needle was found. This time in Townsville. Empty shelves, normally stocked with strawberry punnets, are seen at a Coles supermarket in Brisbane in September. By September 17, the situation was spiralling out of control. Needles were being found in Tasmania, in New Zealand. The two biggest food distributors in New Zealand announced they were stripping Australian strawberry stock from their shelves. A pin had been found jammed in a banana at a Queensland supermarket. And the following day, heartbreaking footage emerged of tonnes of strawberries, dumped in the bush. Donnybrook Berries had been forced to dump all their stock. "This here is a video of all our strawberries being dumped. This here is worth more than you could ever imagine and in three days we lost it all," Stephanie Chheang, whose mother and stepfather run Donnybrook, wrote in a widely-shared Facebook post. "They work hard to make the money for our family and to have these selfish individuals destroy it is just so upsetting. "This will not stop my family from doing what they do best, if anything they're going to do it better." The footage she posted was shocking. A mountain of strawberries. A wasteland of strawberries rotting in the sun. Palaszczuk responded with a $1 million pledge to assist strawberry growers and help the industry get back on its feet. But the reports kept coming. Dozens and dozens. A child at a Brisbane school reported finding a needle in a strawberry. Soon after, police advised the report had since been "disproved". Attention seekers as well as copycats were at play now. Police were inundated with reports. The investigation was becoming more and more complex. Chief Health Officer Jeannette Young again told people to cut up their strawberries. "We've got quite a few cases," she said. "I don't really want to go into detail because that will affect how we deal with this going forward in terms of finding the culprit or culprits and coming to a conclusion. "So it's really important that we keep this information as tight as possible." By September 18, Jennifer Rowling, on behalf of the Queensland Strawberry Growers Association, was calling for calm. "Fundamentally, we are looking at a very small number of confirmed cases of actual tampering related to just three brands," she said. "All other reported cases have either been copycats or unsubstantiated claims." Needles and pins had now been found in strawberries in New South Wales, Victoria, South Australia, Tasmania and the ACT. 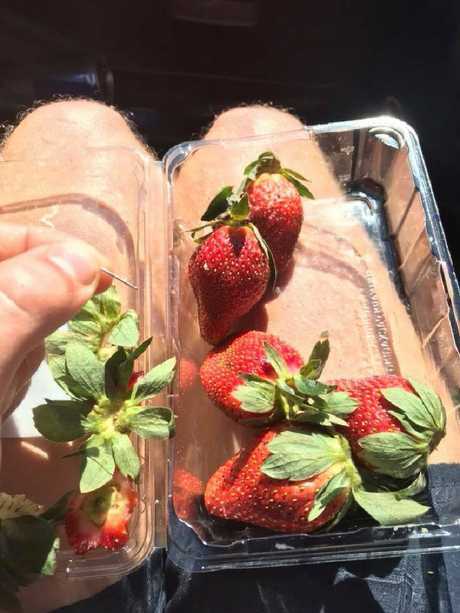 Image posted on Facebook from a shopper claiming to have found a needle in strawberries bought from a Hobart supermarket. The person responsible for putting a pin in a banana had been cautioned by police. The woman, on a motorised scooter, had been spotted in the act at a supermarket in Maryborough. Police confirmed the 62-year-old had been "referred to appropriate support services". "This issue has attracted attention as far away as Russia and the UK, and as a result a number of our trade partners have either already blocked Australian strawberry imports or are talking about doing so," Rowling said. Suncoast Harvest, a Sunshine Coast-based farm, had been forced to tell 100 workers they were no longer needed. Their crops would be destroyed. September 19 and the Prime Minister was weighing in. The penalty for food tampering would be increased, he told ABC's Steve Austin. They were rushing it through Parliament. "I'm seeking to shut this down in terms of all these other copycats by making it really clear," he said. And as the politicians made their proclamations, an enormous team of detectives quietly continued their work. "We will take action against anybody providing false claims or pranking, including children," Deputy Commissioner Steve Gollschewski said. A team of 100 police officers and detectives were on the job. By late September more than 200 reports of contaminated strawberries had been received nationwide. Police all over Australia were involved. But by now, Queenslanders, ever supportive of farmers in crisis, were fighting back. They lined up at farm gates, happy to buy their strawberries direct. Crates of them. Boxes of them. Early November and the copycats had got bored and gone away. If detectives were any closer to solving the case, they were saying nothing publicly. It had all been a social media scare campaign, the strawberry industry said. Strawberry sales were returning to normal and Rowling, from the growers' association, insisted: "The quality, integrity and freshness of local strawberries was never an issue." "It is now obvious the issue was tampering with packed fruit, most likely after purchase. "It was a crisis driven by social media and the only real victims were the growers, and the global reputation of Australian fruit and produce." But days later came a major development in a case that many thought could not be solved. DNA results had come in. 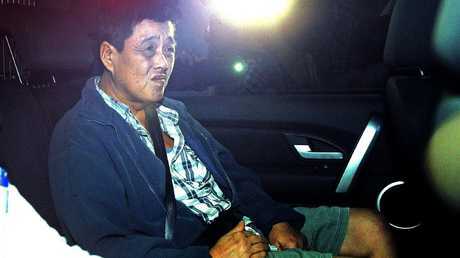 A worker, My Ut Trinh, a Vietnamese migrant who'd arrived in Australia by boat 20 years earlier, was arrested and driven to the city watch house. Detectives charged her with seven counts of contaminating goods with intent to cause loss. She'd been a person of interest for two months. She'd allegedly made threats of revenge. Trinh was a supervisor at Berrylicious/Berry Obsession. She supervised fruit pickers. The farm supplied to other distributors. "The prosecution case is quite strong," police prosecutor Cheryl Tesch told a court hearing this week. "There is DNA evidence located on the needle in one of these strawberries which is a direct match to the defendant." Magistrate Christine Roney, while hearing an application for bail, said Trinh's alleged actions were "difficult to understand". "It's a most peculiar way to go about agitating or promoting a workplace grievance," she said. Drug and Serious Crime Group Detective Superintendent Jon Wacker said it had been one of the most "trying" investigations he'd been involved in. "We've worked tirelessly. It's a fairly unique investigation where virtually the whole of State Crime Command - over 100 members - undertook the investigation," he said. "We reached out to our counterparts throughout Queensland and Australia, and as I said, it was 231 reports Australia-wide so it's a fairly unique investigation impacting virtually every state and jurisdiction in Australia. "We were never going to say never … we just didn't give up."